Beef Vegetable Soup, with home made stock, an easy Supper Soup for two. This could also be called 'root vegetable soup'. 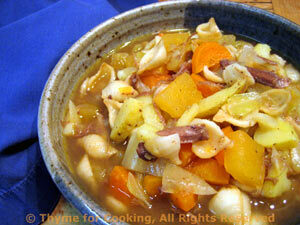 I know some people are leery of rutabagas, but it really is a key ingredient to this soup. It adds a sweet undertone that's essential to this winter soup. This makes 6 servings.... It freezes well. Bring the stock to a good boil over medium high heat. Chop the onion and celery. Add to the soup. Peel the rutabaga (use a vegetable peeler) and cut into small bite-size pieces. Add to soup. Peel the carrots, cut in half lengthwise, then slice into 1/8" (.3cm) half circles. Add to soup. Cut the potatoes roughly the same size as the other vegetables, add to the soup. (I scrub, but don't peel). To cut cabbage, cut off a large slice next to the core. You'll want about 3 cups, so you may need another slice off the other side. . When all of the vegetables are in bring it back to a boil, reduce heat, cover and simmer 45 minutes. While the soup cooks, cut the beef into bite-size pieces and sauté in a nonstick pan until browned. Heat oil in large pot. Brown the beef very well on all sides over medium high heat, about 20 minutes. Strain soup and chill at least 4 hours - this allows the fat to congeal on the surface for easy removal. Once fat is removed, stock can be boiled to reduce and increase strength.